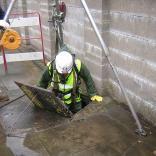 Draintech are able to carry out Confined Space Entries, we have specialist trained Operatives and equipment to work safely and effectively within these hazardous and safety critical environments. Draintech's Engineers are trained to City and Guilds (6150-02) Level 2 Award in working in Medium Risk Confined Spaces and all entry equipment is calibrated by our professional and approved supplier in line with HSE legislation. Health and Safety is critical for Draintech especially in these environments and we work in conjunction with specialist rescue companies for the provision of emergency rescue and risk planning. k from conditions or substances and poor access.